The total number of referees is 28405 an increase of 5 per cent from 2010. There are 6,000 more referees than in 2008 Quantity and quality - Accompanied by Referee Development Officers, Referee mentoring, Referee academies, Improved IT support. The Referee’s experience - Respect marks were collected for 24,000 games from 4,500 referees. Average marks was 4 out of 5. Overall most match officials have an enjoyable experience of officiating and are treated with respect by most participants. Overall across the FL and PL dissent has fallen by 16 per cent since 2008/09. Since 2008/09 Dissent has declined across the 15 senior leagues and divisions by 16 per cent. The number of misconduct charges such as ‘Surrounding a match official’ or Technical area offences also fell in comparison to 2010/11. 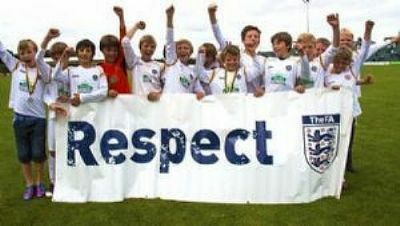 In The FA’s annual Grassroots Survey 56 per cent of respondents reported that their experience of the game had improved as a result of measures introduced through the Respect programme - up from 40 per cent in 2009-10. The same survey ranked ‘Continuing to implement the Respect Programme’ as the third highest priority for The FA to attend to behind ‘Improving facilities’ and ‘A qualified referee for every organised game'. The FA has launched a rewards scheme to help tackle the ugly side of the game, and is accepting nominations from the football public. The new Respect Awards recognise the selfless work being done by football’s volunteer league administrators who implement and promote The FA’s Respect programme at the grassroots level.